In 2009 Lisa Copen started a "30 Things" meme. 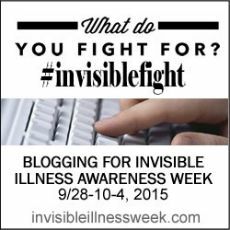 Each year hundreds of people with invisible illnesses fill this out and share it on their blogs and social media. I think this is my fifth time filling this out. It is interesting to me to look over my old "30 Things" and see which answers change and which answers stay the same each year. You can visit the Invisible Illness Week website to read what others have shared for their 30 Things. 1. The illnesses I live with are: POTS, Gastroparesis, Migraines, and Ehlers-Danlos Syndrome Type III (EDS III). To keep things simple, I usually just say I have “dysautonomia,” an umbrella term for dysregulation of the autonomic nervous system. For me, “dysautonomia” covers POTS, gastroparesis, migraines, and other symptoms of autonomic dysfunction that I have. 2. I was diagnosed with it in the year: EDS III was first diagnosed sometime around 1992. POTS was diagnosed in 1995. Gastroparesis was diagnosed in 2007. Migraines were diagnosed in 2010. 3. But I had symptoms since: EDS III is a genetic condition that I have had since birth. Gastroparesis symptoms began in 1990. POTS symptoms began in 1994 or earlier. Migraines began in 2001. 4. The biggest adjustment I’ve had to make is: Learning to let other people take care of me and my children. 5. Most people assume: that if I am smiling and talking, then I am feeling well. 6. The hardest part about mornings is: waking up to a weak, miserable, sick feeling in my body. Each morning I pray for grace and strength to wake up and make it through the day. 7. My favorite medical TV show is: I don’t usually watch medical TV shows. 8. A gadget that I especially appreciate is: my smartphone! It has been a blessing! It is a huge help in keeping me connected to the outside world. When I am too tired or weak to use my laptop, I can read blogs on my phone, watch a Periscope broadcast, or listen to a podcast. 9. The hardest part about nights is: winding down and falling asleep. It takes my nervous system a long time to settle down enough so I can sleep. If I have a “boring” day it takes my body about 4 hours to wind down and go to sleep. If I have an exciting day, it can take 6 hours or more to wind down and fall asleep. 10. Each day I take a few prescription medications. I also take a quite a few vitamins and supplements that help with energy production at the cellular level. 11. Regarding alternative treatments I: do not participate in them for the most part. I have researched alternative treatments thoroughly, but I have found that most of them are religious in nature and are treatments that I cannot participate in with a clear conscience before God. 12. If I had to choose between an invisible illness or a visible illness, I would choose: to leave it in the Lord’s hands. He knows what is best for me. 13. Regarding working and career: I don’t feel like I am missing out on a career, but I do really wish that I could be a stronger and more active wife and mother. It saddens me that I cannot do more for my family. 14. People would be surprised to know: that I get lonely. 15. The hardest thing to accept about my new reality has been: that I cannot have a large family. 16. Something I never thought I could do with my illness that I did was: give birth to two babies! 17. The commercials about my illness: are nonexistent. 18. Something I really miss doing since I was diagnosed is: hiking, walking, playing, swimming, ice skating, exercising, and generally being active. 19. It was really hard to have to give up: spending a lot of time with my family. 21. If I could have one day of feeling normal again I would: go camping with my husband and children. 22. My illness has taught me: that I have very little control over my body and my health. I can eat healthy food and get adequate rest, but I cannot bring good health to my body. God is truly the One who sustains me, and I will only and always have the level of health that He gives me. 24. But I love it when people: encourage me, say that they are praying for me, and reach out to me in genuine friendship. 26. When someone is diagnosed I’d like to tell them: I am so sorry. I will be praying for you. If you ever want to talk, know that I am here for you. 27. Something that has surprised me about living with an illness is: how strange my life is compared to other people in their thirties. 28. The nicest thing someone did for me when I wasn’t feeling well was: send a care package when I was too tired to have visitors. The gifts were a tangible reminder that someone saw me, saw my pain, and cared enough to be my friend in the hard days too. 29. I’m involved with Invisible Illness Week because: I want to let those with invisible illness know that they are not alone, and I want to help those who are healthy know how they can reach out to their friends who have a chronic illness. 30. The fact that you read this list makes me feel: a little bit embarrassed, but mostly grateful.